A prodigious talent recognized worldwide for his artistry, Pinchas Zukerman has been an inspiration to young musicians throughout his adult life. In a continuing effort to motivate future generations of musicians through education and outreach, the renowned artist teamed up in 2002 with four protégés to form a string quintet called the Zukerman ChamberPlayers. Despite limited availability during the season, the ensemble amassed an impressive international touring schedule with close to two hundred concerts and four discs on the CBC, Altara and Sony labels. 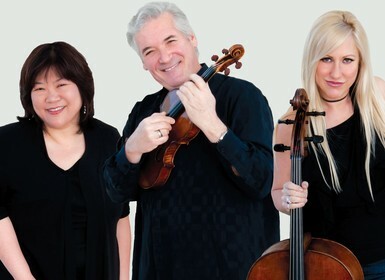 Beginning in 2011 Zukerman, along with cellist Amanda Forsyth and pianist Angela Cheng, began offering trio repertoire as an alternative to the quintet works with the ChamberPlayers. In addition to piano trios by Mendelssohn, Beethoven, Dvorak and Shostakovich, programs often include duo performances with various couplings including the Kodaly Duo. Invitations from major Festivals and venues led to the official launch of the Zukerman Trio in 2013. The ensemble has traveled around the globe to appear in Japan, China, Australia, Spain, Italy, France, Hungary, South Africa, Istanbul, Russia, and throughout the United States. Appearances at major festivals have included the BBC Proms, Edinburgh, Verbier, and Bravo! Vail. This season, the Zukerman Trio returns to Australia for performances at the Adelaide Town Hall and the Ulkaria Cultural Centre. Other highlights include appearances at Chamber Music Sedona, Chamber Music Society of Detroit and the Music Institute of Chicago. The 2017-2018 marks Mr. Pinchas Zukerman’s ninth season as Principal Guest Conductor of the Royal Philharmonic Orchestra and his third as the Adelaide Symphony Orchestra’s Artist-in-Residence and includes over 100 concerts worldwide. He joins long-time friend Itzhak Perlman for a gala performance with the Israel Philharmonic Orchestra at Carnegie Hall and duo recitals in Boston, Newark, Miami, and West Palm Beach. He tours with cellist Amanda Forsyth and the Zukerman Trio, and leads the National Arts Centre Orchestra, Baltimore, San Diego, Vancouver, Nashville and New West Symphonies, among others, as soloist and conductor. Born in Tel Aviv, Pinchas Zukerman came to America in 1962, where he studied at The Juilliard School with Ivan Galamian. He has been awarded a Medal of Arts, the Isaac Stern Award for Artistic Excellence, and was appointed as the Rolex Mentor and Protégé Arts Initiative's first instrumentalist mentor in the music discipline. A devoted and innovative pedagogue, Mr. Zukerman chairs the Pinchas Zukerman Performance Program at the Manhattan School of Music, where he has pioneered the use of distance-learning technology in the arts. He currently serves as Conductor Emeritus of the National Arts Centre Orchestra of Canada, as well as Artistic Director of its Young Artist Program. Canadian Juno Award-winning Amanda Forsyth is considered one of North America's most dynamic cellists. Her intense richness of tone, remarkable technique and exceptional musicality combine to enthrall audiences and critics alike. From 1999-2015, Amanda Forsyth was principal cellist of the National Arts Centre Orchestra, where she appeared regularly as soloist and in chamber ensembles. She is recognized as an eminent recitalist, soloist and chamber musician appearing with leading orchestras in Canada, the United States, Europe, Asia and Australia. As a recording artist she appears on the Fanfare, Marquis, Pro Arte and CBC labels. Consistently praised for her brilliant technique, tonal beauty and superb musicianship, Canadian pianist Angela Cheng performs regularly throughout North America as a recitalist and orchestral soloist. Angela Cheng has been Gold Medalist of the Arthur Rubinstein International Piano Masters Competition, as well as the first Canadian to win the prestigious Montreal International Piano Competition. Other awards include the Canada Council's coveted Career Development Grant and the Medal of Excellence for outstanding interpretations of Mozart from the Mozarteum in Salzburg.